Publics around the world are decidedly unhappy about their nations’ economies. Most are displeased with current economic conditions and concerned about rising economic inequality; few are optimistic about the coming year. However, at the same time, most global publics say their personal finances are in better shape than their national economies, according to a new 39-nation survey. But one of the most striking divides in global economic attitudes is that citizens of emerging market countries are overall more pleased with their economies than are people in advanced or developing economies. In 2013, a median of 53% in emerging markets say their national economy is doing well, compared with 33% in developing countries and 24% in advanced economies. Attitudes are particularly grim in European countries, such as France (9% good), Spain (4%), Italy (3%) and Greece (1%). Publics in emerging markets such as China (88%) and Malaysia (85%) say their economy is doing especially well. Despite unhappiness with the national economy in most countries, many around the world say they are doing well personally. 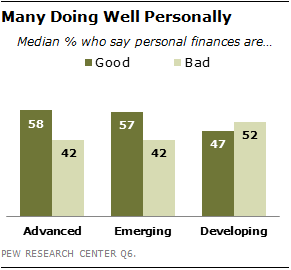 Medians of roughly half or more in each type of economy say their personal finances are good. In the advanced and developing economies, the median percentage who are satisfied with their personal situation is much higher than ratings of the national economy. Among advanced economies, personal financial well-being is rated 34 percentage points higher than national conditions; in the developing countries, the gap is 14 points. And among both the developing and emerging economies, the publics are also optimistic about the future of their personal finances (medians of 53% and 52% say they will improve in the next year, respectively). Only 24% feel the same in the advanced economies. Nonetheless, despite concerns about their personal economic outlook, people in advanced economies are much less likely than publics in either emerging or developing economies to report lacking the money to purchase food, health care or clothing for their family. Economic inequality is a common concern for publics around the world. Most people agree that the economic system favors the wealthy. Majorities in most countries say the gap between the rich and the poor has increased in the past five years. This attitude is particularly prevalent among those who live in advanced economies. And at least half in most countries say the wealth gap is a very big problem in their nation, with the developing economies expressing especially high levels of anxiety. Notwithstanding these concerns, nearly every public surveyed wants the government to focus on creating jobs or taming inflation as a top priority, rather than on reducing economic inequality. Publics’ attitudes reflect their economic reality – and the global downturn that started after 2007 has had a profound impact on many countries’ economies. Annual growth rates have slowed over recent years in most nations surveyed. This slowdown has been particularly severe in the advanced economies, which had a median annual growth rate of 3.5% in 2007 but just 1.4% in 2012. Growth has also declined in the developing economies (median of 6.8% to 3.6%) and the emerging markets (median of 6.3% to 3.9%). Despite a drop in growth rates for the advanced economies, this group of countries continues to be much wealthier than the emerging markets, even as the gap has closed somewhat. 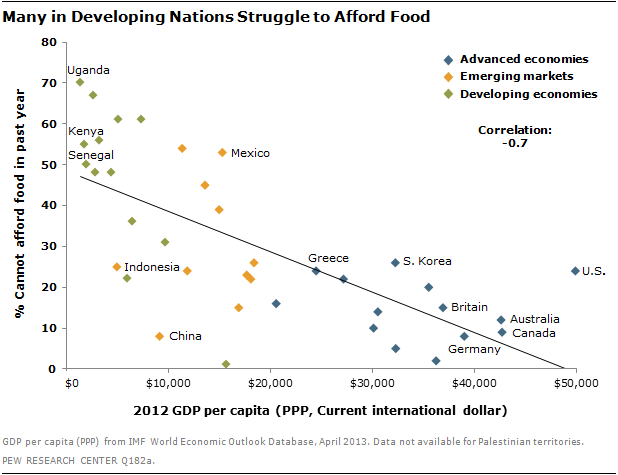 And the developing economies continue to be considerably poorer than the two other types of economies. Majorities in 26 of the 39 countries surveyed think their economy is faring badly. Among the advanced economies, this includes roughly eight-in-ten or more in Greece (99%), Italy (96%), Spain (96%), France (91%), Britain (83%), the Czech Republic (80%) and South Korea (79%). In the developing economies, the Lebanese (90%), Tunisians (88%) and Pakistanis (81%) express comparable levels of dissatisfaction. Publics in the emerging markets, meanwhile, are less likely to say they are unhappy with their national economies – fewer than half in many of these countries say things are going poorly in their nation. (-54 points). In the developing economies, attitudes among Pakistanis (-42 points) and Egyptians (-30) have soured the most. Many other countries in these two groups have experienced declines of at least 10 points or more. In the emerging markets, meanwhile, only in Mexico (-13) have good reviews of the economy fallen by more than 10 points since 2007. Everywhere else, the change has either been minimal or the mood has improved. The emerging markets also tend to be somewhat more optimistic about the coming year than others – a median of 48% say they expect national economic conditions to improve in the next 12 months, while only 17% say things will get worse. A median of roughly four-in-ten (43%) in developing economies also think things will get better, but 21% say they expect the economy to decline. The advanced economies are the most pessimistic – a median of just 25% say the economy is going to improve, while nearly a third (32%) think things will get worse in the coming year. The Greeks (64%) and French (61%) are the most pessimistic about the next 12 months. The culprits for these widespread economic woes are both a lack of employment opportunities and rising prices. Creating jobs is clearly the top priority among the publics in advanced and developing economies (medians of 49% and 44%, respectively). However, people in emerging markets are more divided – a median of 33% name employment as the top priority while an equal percentage says the same about inflation. 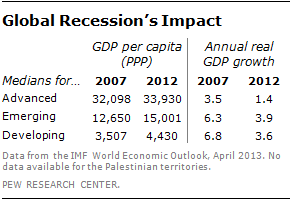 Despite gloomy national conditions, many say their personal economic situation is good. This is one area where the emerging markets are not alone in their positive attitudes – a median of 57% among emerging market publics say things are going well personally, and a nearly equal percentage (58%) among the advanced economies feels good about their family finances. Publics in developing economies are somewhat less satisfied with their personal situation (47%). Publics’ positive views of their personal situation have also changed little during the recession. Among the 20 countries surveyed in 2008, the first time the question was asked, and in 2013, satisfaction with personal finances declined by 10 percentage points or more in only five countries – Poland (-19 percentage points), Spain (-17 points), Mexico (-12 points), Pakistan (-11 points) and France (-10 points). Meanwhile, among some publics – especially in the emerging markets – positive reviews of their personal finances have gone up since 2008, including by 12 percentage points in Turkey, nine points in Indonesia, eight points in South Africa and six points in Argentina. In addition, many are optimistic about their personal future. Medians of at least half in the developing economies (53%) and the emerging markets (52%) say they expect their own finances to improve over the next year. Publics in the advanced economies, however, are decidedly less optimistic about their personal outlook – a median of just 24% expect their own finances to get better in the next 12 months. Medians of roughly two-in-ten or fewer in advanced economies say they have been unable to afford the food, clothing or health care their families needed at some point in the past year. In the emerging markets and the developing economies, reports of deprivation are much higher. Among the emerging markets, medians of at least a quarter say they have had trouble getting basic necessities for their families. In the developing economies, roughly half or more in most countries report not being able to afford food, health care or clothing, especially in the African nations surveyed. 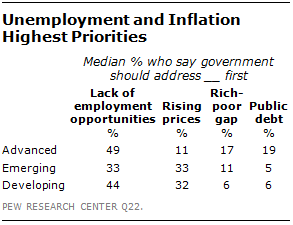 Even though inequality is not a top priority, it is a major concern for the publics surveyed. 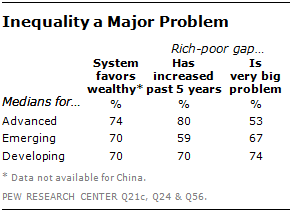 Clear majorities in most countries say the gap between the rich and the poor is a very big problem for their nation. Concern is especially high in developing economies, where a median of 74% say they are very worried. Somewhat fewer – though still high percentages – say the same in the emerging markets (67%) and the advanced economies (53%). In addition, broad majorities in 31 of the 39 countries surveyed say the income gap has increased over the past five years. Reports of a rise in income inequality are particularly high in the advanced economies, where a median of 80% say things have gotten worse, compared with medians of 70% in the developing economies and 59% in the emerging markets. An uneven distribution of wealth in a country may be due to an imbalanced economic system. Roughly two-thirds or more in most countries say their economic system favors the wealthy. Only in Malaysia (56%), Venezuela (53%) and Australia (51%) do at least half say the economic system is fair to most people in their country. People are also skeptical about the potential for the next generation to move up. Across the 39 countries surveyed, fewer than half in 25 countries believe their nation’s children will be better off financially than their parents. Despair over the future is particularly high in the advanced economies, where roughly four-in-ten or fewer say things will get better for young people. Among this group, South Korea is the sole exception – 56% think children will be better off.